1. 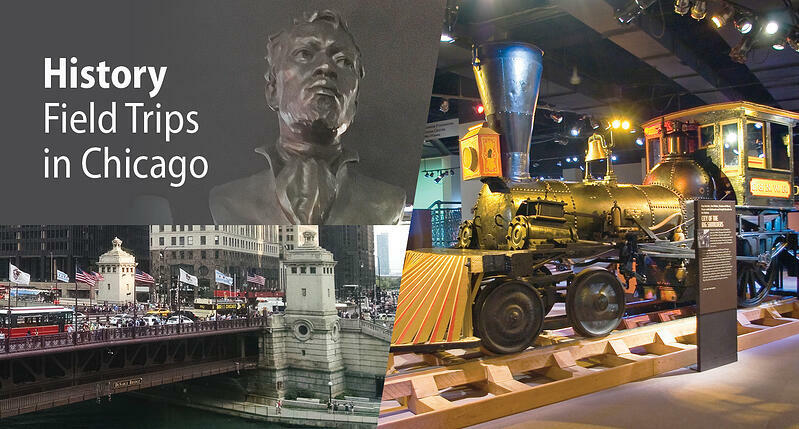 The Chicago History Museum is Chicago’s oldest cultural institution with a history of its own dating back to its founding in 1856. The museum survived the Great Chicago Fire of 1871 and offers a deep and rich historical look at the city and its significance in the world. For pre-K and kindergarteners – an exploration of the history of trains through “Crazy for Trains” hands-on discovery bags containing early reader books, a conductor’s vest, paper train ticket and hole punch, and more. Teachers can also use the online pre- and post-activity guide to make the most of the visit. For elementary students – brings history alive through age-appropriate workshops, activity stations, film, and a giant touchscreen challenge. In the History a’ la Cart activity stations, students in grades three to eight work with trained staff and volunteers on 20-minute, hands-on projects that take them into history and enable them to imagine what it was like in times gone by. For high school students – programs for older students are designed to encourage them to go beyond observing and think critically about historically significant events, periods and people. Also available are self-guided iPod audio tours and role playing in "Chicago: Crossroads of America," a permanent exhibition. Available by appointment are “Touch Tours” for the blind or visually impaired led by volunteer gallery interpreters. African Women and the Origins of Mathematics. The Pyramids of Giza: Marvel of Human Achievement. African Presence in the Americas Before Columbus. Maafa-Great Tragedy: Was It a Trade? Jean Baptiste Pointe DuSable: Enterprising Pioneer, the Father of Chicago, and Peacemaker. 3. The American Writers Museum is recommended for students ages 12 or higher and examines writers, writing and the written word as elemental to the American, and indeed the human experience. Writing has the ability to transform and transmit, to illuminate and elucidate, and to entertain both the writer and the reader. So much that we hold dear in this world has been recorded in writing, beginning with the earliest human drawings on cave walls through the digital volumes of today. Immersing students in everything writing will give them a new appreciation for this art. "The Stead Family Foundation Writers Hall," featuring two interactive touch screens that let students discover writers from their hometowns. "A Nation of Writers: John and Cathie Estey," looks at 100 American writers from 1600 forward in an in-depth look at great American writing plus an immersive “word waterfall” experience. "The Mind of a Writer" takes students into the lives and the minds of writers, investigating how writers think and live so they can perfect their craft and “make the writing sing.” This exhibit helps students better understand how writing happens and what writers do to achieve the style, tone and quality they strive for. Within the exhibit, students can add a line to a story started with one line (usually from an American work), and written one line at a time by visitors throughout the day. Or they can play one of the word games exploring, sampling, and even inventing new words. A River and Its City. Though just a few of the many historical offerings in the City of Chicago, student of all ages will remember these trips for years to come. When you chose your favorites, don’t forget to charter Indian Trails to take you there in safety and comfort. And if you’re new to field trips, download our “Professionals Guide to Bus Trips with Kids” for great advice and helpful information!